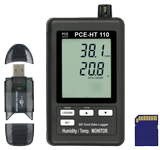 The PCE-HT-110 humidity meter measures air temperature and relative humidity and saves them on SD card. 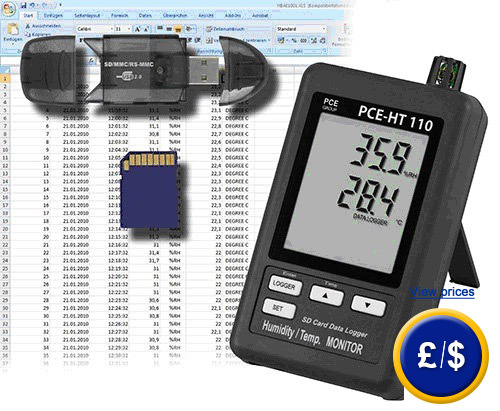 The PCE-HT 110 humidity meter is a compact device with a flexible memory (from 1 to 16 GB). 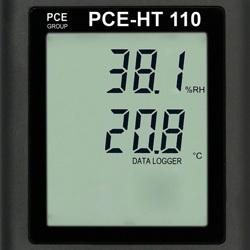 The PCE-HT 110 humidity meter is the ideal device for taking measurements over an extended period of time in such places as supermarket refrigerators, cold transport and storage as well as for taking measurements in the industrial sector for heating and cooling processes, machine operating temperature and for product storage. The current reading is shown on the LCD and it is simultaneously recorded onto the SD card. 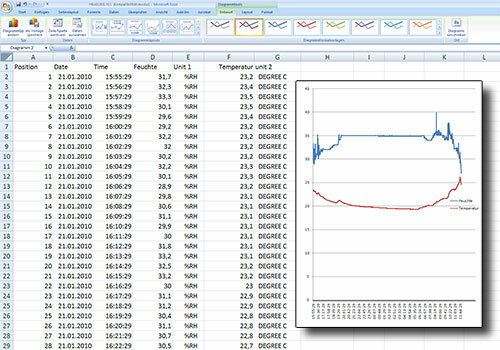 So this value can be directly seen on the display or it can be transferred to a computer or a portable computer for further analysis (e.g. xls file). The PCE-HT 110 can be programmed (date and measuring rate) and it can store data on site. You can also check the number of columns to detect outliers and in fast food industry, whether and how long the cold chain was broken. The internal clock with date allows the user to organise the data accurately. Measurement intervals can be adjusted by the user. The PCE-HT 110 enclosure is resistant to dust and water and the electrical components are protected from impacts that might occur in the industrial sector. 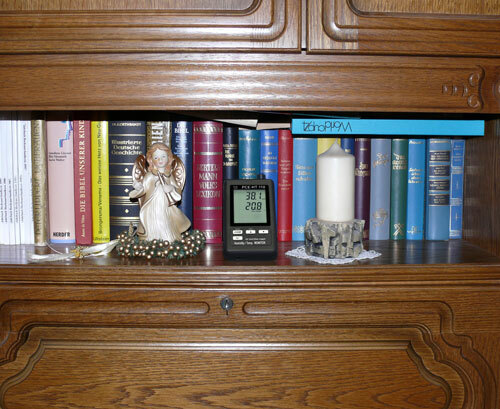 Here you can see an overview of all the humidity meters available at PCE-Instruments. - Measures temperature and relative humidity. format in the SD card. 0 … +50 °C/10 ... 90 % H.r. > +70 % H.r. ±4 % of the measurement value ±1 % H.r. 0...+50 °C/0 ... 90 % H.r. To transfer data to a PC or portable computer. No further software to save data is needed. For companies that wish to incorporate the calibrator into their set of internal test devices or for annual recalibrations. Mains component to record temperature and humidity (230 V/50 Hz). It is ideal for continuous measurements.